Troubled waters: What’s behind the Russia-Ukraine naval standoff? Kiev: Russia seized three Ukrainian ships after firing on them near the annexed Crimean peninsula on Sunday, threatening a dangerous escalation in the crisis between the two countries and prompting Kiev to put its forces on full combat alert. The standoff is the result of months of rising tensions over ships navigating the Azov Sea, a body of water north of the Black Sea shared by Ukraine and Russia. Kiev accuses Moscow of trying to impose a de facto economic blockade on its ports in the Azov Sea to weaken it as part of a “hybrid war” against Ukraine, and has called for further Western sanctions against Moscow. The countries have been at loggerheads since Russia seized Crimea from Ukraine in 2014 and backed an insurgency in the eastern Donbass region that has killed more than 10,000 people despite a notional ceasefire. Squabbles over control of the Azov Sea and the Kerch Strait, which connects to the Black Sea to the south, are nothing new. Tensions flared in 2003 during Vladimir Putin’s first term as Russian president. These were calmed with a 2003 bilateral treaty stipulating that both countries could use the Kerch Strait and Azov Sea freely for commercial shipping and must notify each other while sending military vessels. Tensions have increased in the area this year, with Ukraine accusing Russia of persistently detaining ships sailing to and from its ports on the Azov Sea, especially Mariupol and Berdyansk, with a view to disrupting trade. Russia in turn accuses Ukraine of harassing Russian ships, and says its own checks on Ukrainian vessels are lawful and necessary to ensure the security of the area. Mariupol, which was briefly seized by pro-Russian separatists in 2014 before being recaptured by Ukrainian troops and volunteers, is a hub for exporting steel and grain and importing coal. Ukraine says trade to the ports has been cut by 30 per cent since Russia began hassling its ships. Exports from Mariupol have fallen 6 per cent and imports by nearly 9 per cent this year, while exports from Berdyansk fell by 12.3 per cent, data shows. Ukraine was also incensed by Russia unveiling in May a $3.6 billion (Dh13.2 billion) bridge from its mainland across the Kerch Strait to Crimea. The Strait links the Azov Sea to the Black Sea. 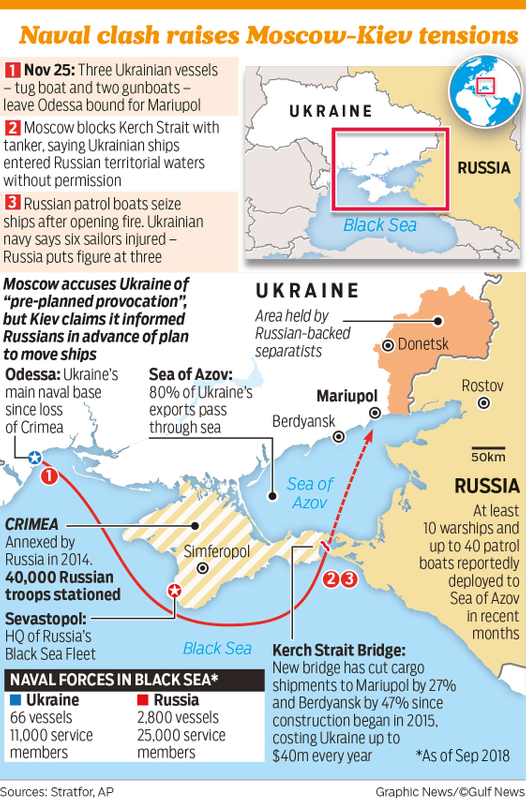 The bridge is too low for certain vessels to pass through, further hampering trade, Kiev says. Ukraine says it has now deployed more air, land, sea and artillery forces to the area and plans to build a military base on the Azov Sea. Russia seized three Ukrainian vessels after opening fire on them, wounding several sailors. 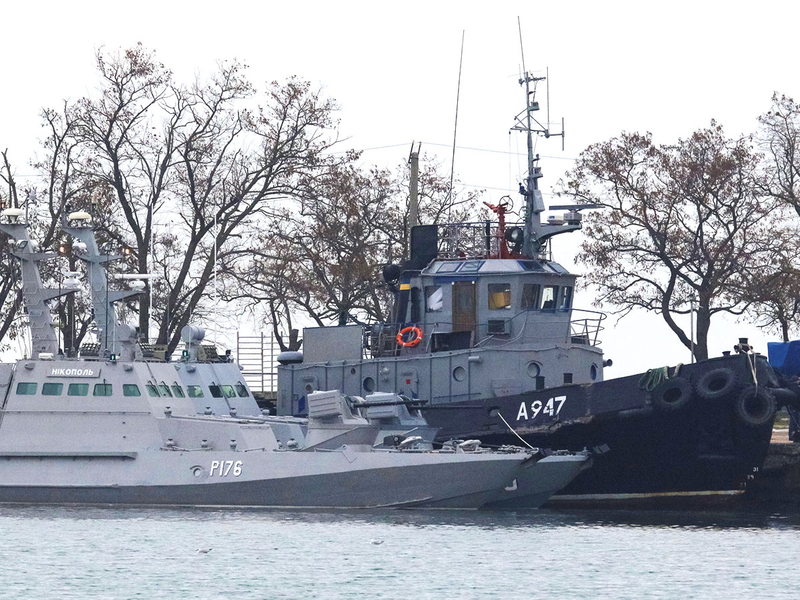 Russia’s FSB security service said the ships — two small Ukrainian armoured artillery vessels and a tug boat — had illegally entered its territorial waters. Russia accused the ships of manoeuvring dangerously and ignoring its instructions with the aim of stirring up tensions. Ukraine said it had notified Russian authorities in advance of the three ships’ movements — in line with the 2003 accord — and denied they had done anything wrong. Traffic through the Strait resumed on Monday. 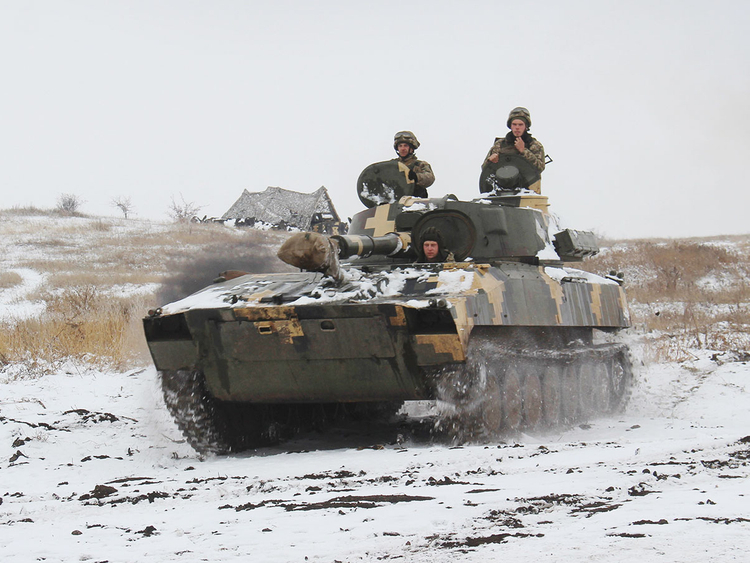 Ukraine has put its forces on full combat alert and President Petro Poroshenko has asked parliament to back his decision to impose martial law. But any military response from Ukraine risks inviting a forceful reaction from Russia, whose Black Sea fleet is stationed in Crimea and outguns the Ukrainian navy. At Kiev’s urging, its Western allies could push for more sanctions on Russia, a prospect which pushed the rouble lower on Monday. The United Nations Security Council will discuss the crisis on Monday at the request of Russia and Ukraine. Nato and the European Union urged restraint on all sides and urged Russia to restore full access to the Azov Sea for commercial vessels. Russian politicians have accused Poroshenko of deliberately instigating the standoff to boost his flagging popularity ahead of elections in March. Some Ukrainian opposition politicians have speculated that he is using the introduction of martial law as an excuse to postpone the elections. Kiev: The Sea of Azov, scene of a new escalation in tensions between Ukraine and Russia, is joined to the Black Sea by a narrow strait that is a vital shipping lane for both the rival nations. Here is some background. Wedged between Russia, Ukraine and Crimea, the Sea of Azov is a northern extension of the Black Sea to which it is linked via the Strait of Kerch, which is just 15 kilometres (nine miles) wide. Dotted by busy industrial ports, the sea’s sole access to the Black Sea — and so the Mediterranean further along — is this strategic strait. A treaty signed between Ukraine and Russia in December 2003 provided for common management of the sea and the strait. It did not, though, demarcate the maritime border between the two countries. Russia’s internationally condemned annexation from Ukraine of the Crimea peninsula in 2014 gave it control of both sides of the strait, and Moscow has been accused of since squeezing access for Ukrainian ships. The Sea of Azov is the shallowest sea in the world, with a maximum depth of just 14 metres (46 feet). It is also small at around 360km long and 180km wide. A Russia-built bridge over the Strait of Kerch and linking mainland Russia to Crimea was inaugurated in May 2018, infuriating Ukraine and its EU and Nato allies. President Vladimir Putin personally championed the Crimean Bridge project, important in reducing Crimea’s reliance on sea transport for supplies, saying it was the realisation of Russia’s historic ambitions. But Ukraine says its larger ships are unable to get under the bridge’s 35-metre arches to and from its ports on the Azov Sea. The result for Ukraine is a significant drop in shipping traffic and economic losses. Condemning the opening of the 19-kilometre bridge in May, the EU said it entrenched the “forced integration” of Crimea with Russia, and “its isolation from Ukraine.” In July the EU expanded its sanctions against Moscow to include companies involved in the bridge’s construction. Ukraine’s important port city of Mariupol is situated on the northern edge of the Sea of Azov and has vital access to heavy industry in the eastern part of the country. 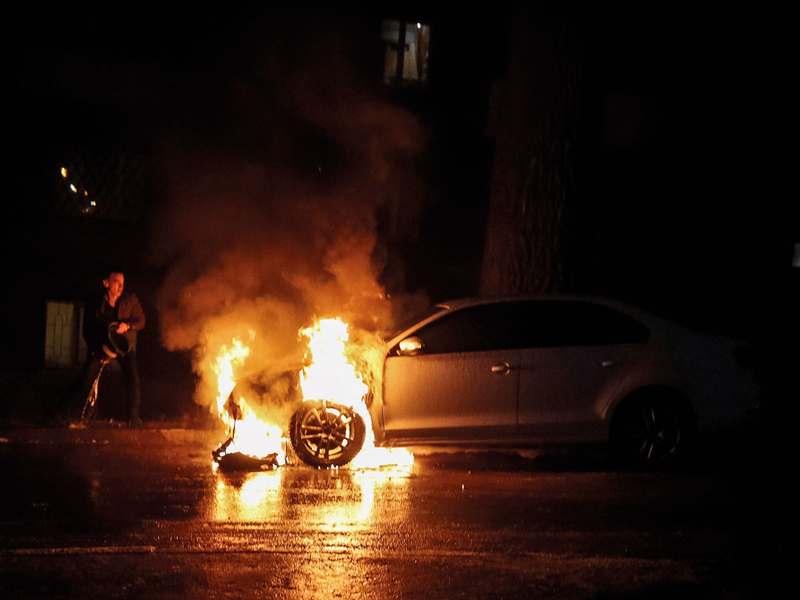 It is the only major city in southeastern Ukraine under government control since pro-Russia separatists seized parts of the east in the wake of the annexation of Crimea. This includes the Russian-backed rebel Donetsk and Lugansk regions, whose conflict with Kiev has caused at least 10,000 deaths since 2014. Mariupol, home to around 500,000 people, is dominated by two vast iron and steel businesses which together employ tens of thousands of people. Kiev and the West have accused Moscow of deliberately blocking ships from accessing the commercial port, some 55km from the Russian border. Ukrainian media have reported that the Mariupol and the Berdyansk port saw earnings fall by almost a quarter during the first seven months of this year, compared with the same period last year. Moscow: Russia’s foreign ministry accused Ukraine on Monday of deliberating provoking an incident in the Kerch Strait near the peninsula of Crimea on Sunday in order to create a pretext for new sanctions to be imposed on Moscow. Russia on Sunday seized two small Ukrainian armoured artillery vessels and a tug boat, which Moscow said had illegally entered Russia’s territorial waters. The foreign ministry said in a statement that it would respond harshly to any attempts to undermine its sovereign and security. Brussels: Nato will hold an emergency meeting with Ukrainian officials at alliance headquarters in Brussels on Monday over the naval standoff with Russia off the coast of Crimea. Russia fired on and then seized three Ukrainian ships on Sunday, accusing them of illegally entering its waters in the Sea of Azov, in a dramatic spike in tensions that raises fears of a wider escalation. Nato chief Jens Stoltenberg held phone talks with Ukrainian President Petro Poroshenko, and officials from the two sides will meet later in the day. “The Secretary General expressed Nato’s full support for Ukraine’s territorial integrity and sovereignty, including its full navigational rights in its territorial waters under international law,” Nato said of Stoltenberg’s call. Kiev demanded the return of its ships and sailors, denouncing “another act of armed aggression” by Russia, which annexed Crimea from Ukraine in 2014. The Ukrainian military has been put on high alert and the country’s parliament is to vote on a request by Poroshenko to impose martial law for 60 days. Ukraine has also urged its Western allies to step up existing sanctions implemented against Russia over Crimea and its role in the ongoing conflict in eastern Ukraine between the government and separatists.